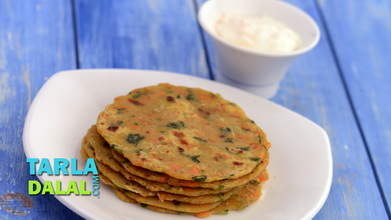 Mixed vegetable paratha: a wholesome breakfast option, which is so tasty that it does not even require a side dish! 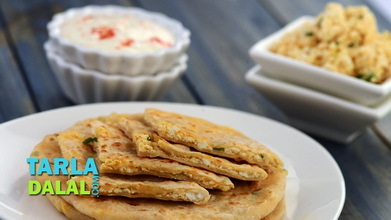 grab all the veggies you can find in your refrigerator and stuff it into this paratha. 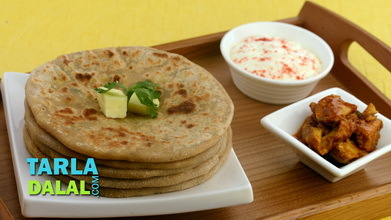 A sprinkling of spices improves the taste of this parathas, while a dollop of butter further enhances it flavours. Combine all the ingredients in a deep bowl and knead into a semi-soft dough, using enough water. Cover and keep aside for at least 10 to 15 minutes. 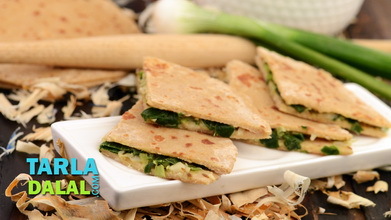 Divide the dough into 5 equal portions and roll out each portion of the dough into a 175 mm. (7”) diameter circle using a little wheat flour. 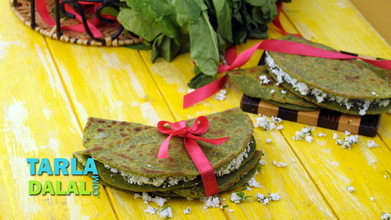 Cook each roti very lightly on a hot tava (griddle). Cover them with a muslin cloth and keep aside. Heat the oil in a broad non-stick pan, add the onions and sauté on a medium flame for 1 to 2 minutes or till the onions turn translucent. Add the mixed vegetables and potatoes, mix well and cook on a medium flame for 1 to 2 minutes, while stirring occasionally. Add the coriander, green chillies, chilli powder, garam masala and salt, mix well and cook on a medium flame for another minute. Remove from the flame and keep aside to cool for a while. Divide the stuffing into 5 equal portions and keep aside. 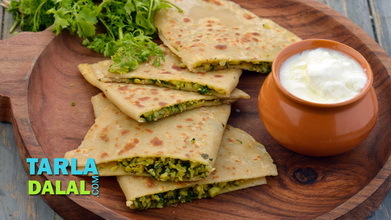 Place a roti on a flat, dry surface, spread a portion of the stuffing on half of the roti and fold it over to make a semi-circle. 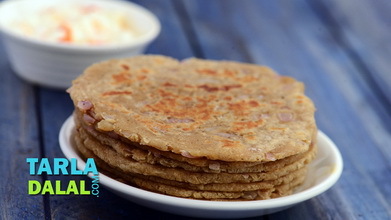 Heat a non-stick tava (griddle) and cook each paratha, using a little oil, till golden brown spots appear on both the sides. 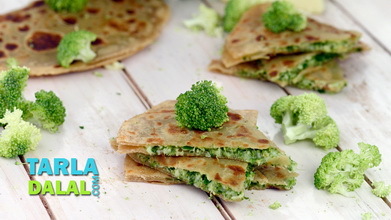 Repeat steps 1 and 2 to make 4 more parathas. Serve immediately with fresh curds.